Faster pain relief and injury recovery! Shockwave Therapy - A New Way to Help Stubborn Injuries Heal! Shockwave Therapy, also referred to as Extracorporeal Shockwave Therapy (EWST) or Radial Shockwave Therapy, is an exciting new tool that physios can use to help in the recovery of a variety of conditions. 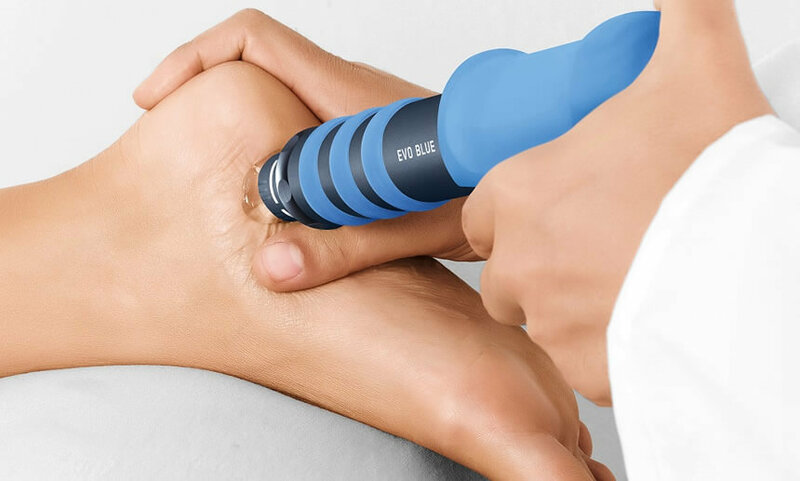 It uses a pneumatic or electromagnetic “motor” to create waves of force through a handheld applicator which then absorb into the tissues underneath the skin which boosts healing in the area. We're excited to be the first Physio clinic to offer Shockwave Therapy in Newcastle - part of our ongoing committment to doing the most we can to help keep you healthy! Who Can Shockwave Therapy Help? Shockwave Therapy can help anyone with a painful condition that has gradually come along without an actual sudden injury. It is particularly useful in conditions that have been present for several months, especially if they haven’t responded to physio or other health treatments. We find this treatment useful for runners and sportspeople who do a lot of training, those who are finding their body starting to ache as they progress through middle age and beyond, and people who do repetitive physical activities in their workplace. Why do we use Shockwave Therapy? A lot of evidence has been done recently showing that Shockwave Therapy has a positive effect on a range of conditions, especially some of the more “tricky” conditions that can often hang around for a long time. 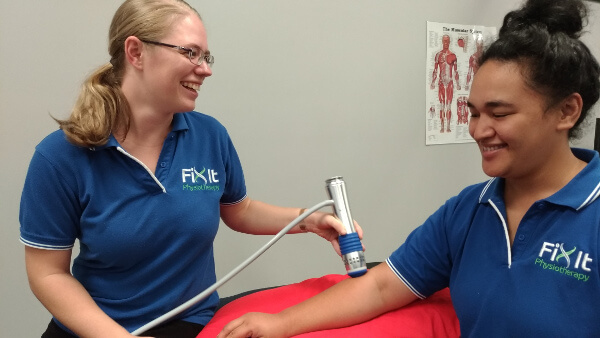 At Fix It Physiotherapy, we like to be at the front of game when it comes to innovation and new techniques, which is why we are the first Physio clinic in Newcastle to utilise the benefits of Shockwave Therapy. There may also be positive effects in the healing of fractures that have been slow to heal and we feel that more conditions will be added to this list in the coming years. What can I expect from a Shockwave Treatment? Treatment lasts about 5 minutes. We apply a gel to the area we are treating and apply light-moderate pressure through the applicator. It’s common to experience some mild discomfort from the shockwaves but we are able to change settings on the machine so that it will be tolerable for you. You will usually notice the area treated goes pink as blood flow increases to the area. Most of the time, you will feel immediate relief from the treatment. The average number of sessions required for satisfactory results is around 3-5 sessions, which are spaced 7-10 days apart. This will change depending on the person and the type of injury but is a good average. Is Shockwave Therapy the same as TENS? No - the term "Shock" is not referring to an electric shock! The shockwave created is a physical wave of force that is created by the machine - think of it as a tiny jackhammer that sends pulses into your body. These pulses then cause the body to activate a healing response. There is no electricity passing through the machine into your body. Does Shockwave Therapy Replace Other Forms of Therapy? A lot of these types of injuries still need to be managed by a physio and Shockwave Therapy is generally just one piece of the puzzle. We usually use shockwave within a consultation, with the rest of the session usually including hands-on techniques and advice on how to manage the balance of doing just the right amount of exercise to strengthen the area without flaring your pain up. We will send out a series of informative emails about how shockwave can help your conditions. If you are interested, please enter your email address in the form below. Or if you just want to book in and try it for yourself - Book Online Now.